Baldock Town returned from Suffolk having been defeated in extra time, but they can hold their heads up high after a battling show against Stowmarket Town. On a bright, but chilly November afternoon, the Reds arrived at Stowmarket’s Green’s Meadow with a place in the FA Vase last 64 up for grabs and during the early exchanges their positive attitude shone through with both Kieran Barnes and Kim Forsythe going close. However, very much against the run of play, Stowmarket took the lead on 14 minutes when a Josh Mayhew header rebounded off the crossbar and prolific striker Ollie Canfer was on hand to put the Stow a goal to the good. The half continued to flow at a frantic pace with two excellent sides going all out at each other. At times, Baldock Town showed some lovely intricate footwork reminiscent of a team placed much higher in the football pyramid, but it certainly wasn’t all plain sailing as more than once it seemed as they were living a charmed life at the back. Jack Farmer was magnificent in goal and with the help of a clearance off the line, the often rampant Stow attack was kept at bay. After 41 minutes Baldock were back on terms when a low Kieran Barnes cross was turned into his own net by Stowmarket centre-back Tom Matthews and when Charlie Joy brought a save from Stow ‘keeper Callum Robinson just before the interval, they could have gone in with an advantage. 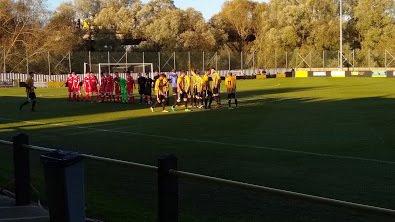 The second half continued in the same vein as the first with end-to-end quality football from two sides intent on securing victory, although it was spoiled somewhat by an over fussy referee who showed yellow cards to Myles Lee, Liam Kenna and Louis Lee. With the scores remaining level at 90 minutes, the match went into extra time and within a minute of the extra period, Farmer was down turning a shot around the post. But after 7 minutes, Stowmarket regained the lead through a curling shot from substitute Max Melanson and suddenly Baldock were playing catch-up. Early in the second period of extra time, the Reds went close from a Daril Ngwala volley, but with 10 minutes left on the clock, while trying to push for an equaliser, Canfer scored his 2nd of the afternoon and ended Baldock’s hopes of progression into the 3rd round. In the dying minutes Louis Lee received a 2nd yellow card, but by then, as tempers began to fray, it was all over. Baldock Town should be proud of the way they battled and had the match conditions been different, they very possibly would be entertaining the Stow this Wednesday evening in a replay. As it is, they return to League action when Biggleswade United will be the visitors in a local derby. Baldock Town: Farmer, M Lee, Furness, Gilbert, Kenna © (Priestner), L Lee, Joy (James), Barker, Brooks (Holland), Forsythe (Ngwala), Barnes. Unused sub Harpur (GK).